One of the most important items offered at Orient Express is the APE Racing Cam Chain Tensioner. Now IN STOCK and available for the 2008-> Up Suzuki GSX 1300R Hayabusa, the APE Racing Cam Chain Tensioner is precision CNC machined from billet aluminum. Blue anodized for great looks and durability, the APE Racing Cam Chain Tensioner is fully adjustable. 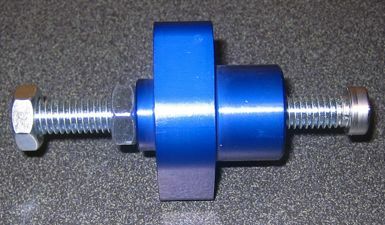 Manual cam chain tensioners are a critical yet inexpensive insurance against expensive engine damage. The APE Racing Cam Chain Tensioner for the second generation Suzuki GSX 1300R Hayabusa is one more component Orient Express is offering to help you get the most performance from your new Hayabusa!